With the latest collection from Chanel - the Nuit Infinie de Chanel Collection - for Holiday/Christmas 2013 hitting counters recently, I was very pleased to find two new and limited edition shades of Illusion D'Ombre's were released. The Illusion D'ombre shadows would have to be one of my favourite products made by Chanel so I could not resist and honestly? I wouldn't even try to resist the call of Chanel and limited edition. It is a very strong pull! 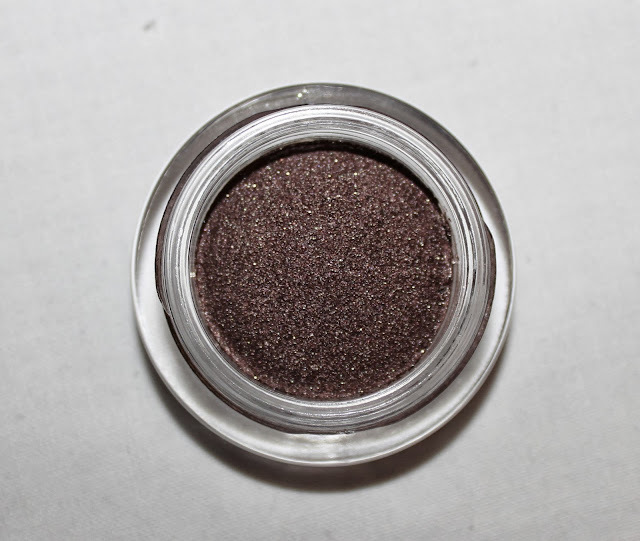 The Illusion D'Ombre shadows are a cream shadow with an almost mousse like consistency. 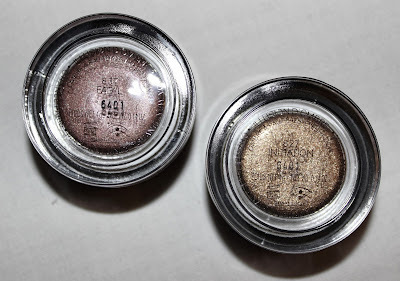 I would consider them one of the best cream shadows on the market - fantastic colours, long wearing and easy to apply. Actually that is pretty much everything I look for in an eyeshadow! The two shades released for this collection are perfect for the holiday season. Rich tones with beautiful soft sparkles make for a very elegant look for all the special occasions that come with Christmas time. 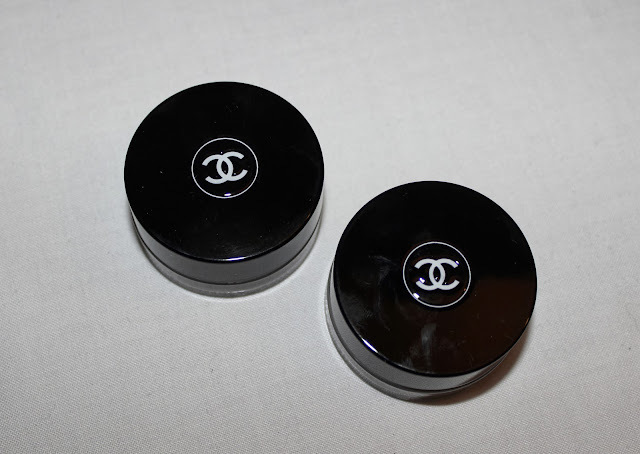 The shadows come housed in the typical glass pot with a black lid with the Chanel logo imprinted on the top. Also included is a little shadow/liner brush which I didn't even take out of the box, I find it pretty useless with these shadows (application tips down below). 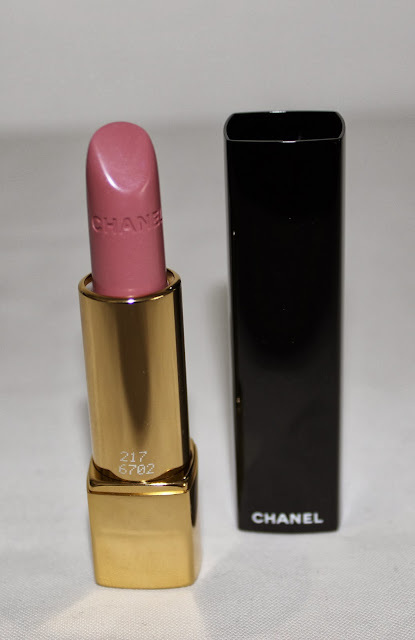 Described as a platinum bronze by Chanel, I find this shade leans to more of a bronze-gold on my skin. 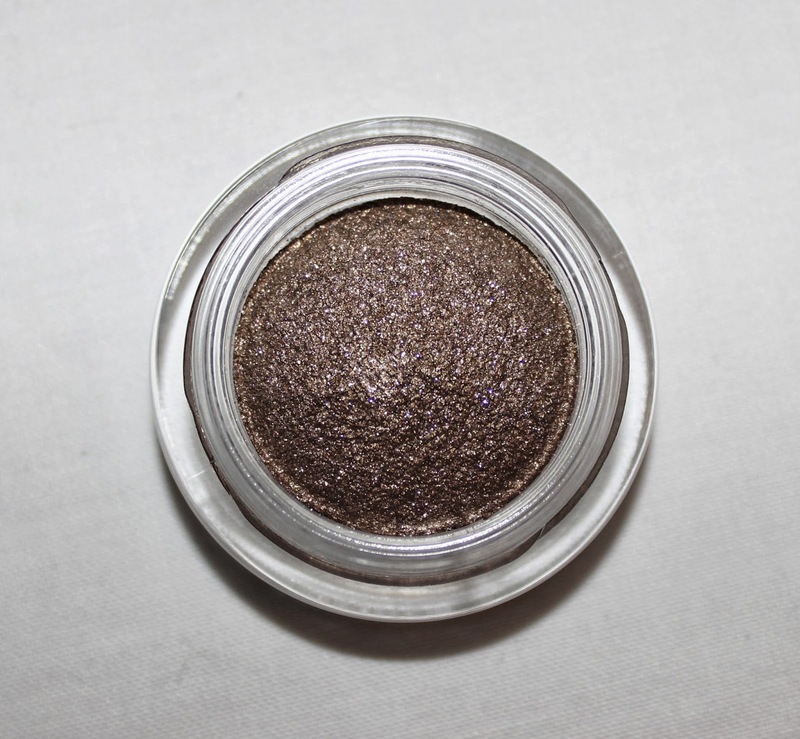 This shade is quite glittery so the pigmentation is not as strong on initial application but can be built up. This wears well for a full day on my eyes with minimal fading at the end of the day and no creasing or shifting on the lid. No fall out either from this more glittery shade. 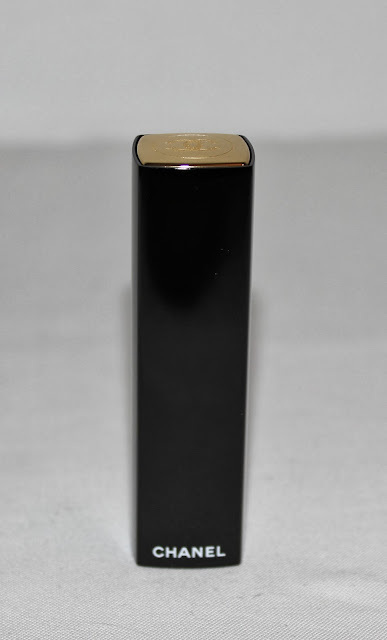 This shade is described by Chanel as silver purple. To me it is more of a medium dark, plummy brown shade. This has more a metallic shine finish than Initiation and definitely less glitter. Pigmentation is good on initial application but can still be built up or sheered down for a more subtle eye look. Again this shade wore well all day with minimal fading by the end of the day but no creasing or shifting on the lid. I know some people have trouble applying the Illusion D'Ombre's and personally I did too to begin with. I now find the best way to apply is to use your fingers to apply the shadows to the lid area and then use a blending brush to soften out the edges (I like to use a Real Techniques Base Shadow brush or a MAC 217). Then use your pinky finger or a pencil brush to apply to the lower lash line. You get a reasonable amount of time to work with these shadows before they set. No primer is necessary but it never hurts. Initiation on the left and Fatal on the right. The swatch is pretty accurate but doesn't really show the glitter in Initiation. It is quite a fine glitter though. This is a couple of finger swipes of each shadow to really show the colours. It is easy to get that opacity on the lid and can be sheered down easily too. Personally I love these shadows and would never hesitate to buy or recommend these. They are just that good. Remember these shades are limited edition so don't think about it too long (meaning just buy them, you won't regret it)! The Illusion D'Ombre's retail for $48.00 for a 4g pot. These are currently out in the Chanel Beauty Boutiques and I would imagine they are out at other Chanel stockists by now too, if not yet then they will be soon. 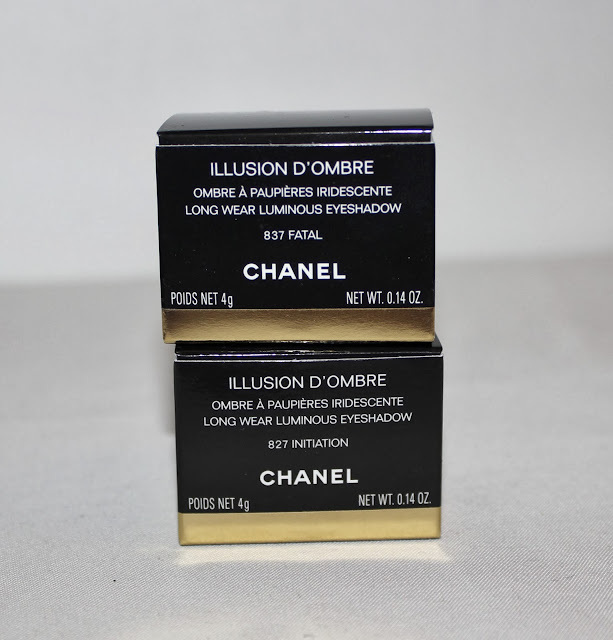 Have you tried the Chanel Illusion D'Ombre's? 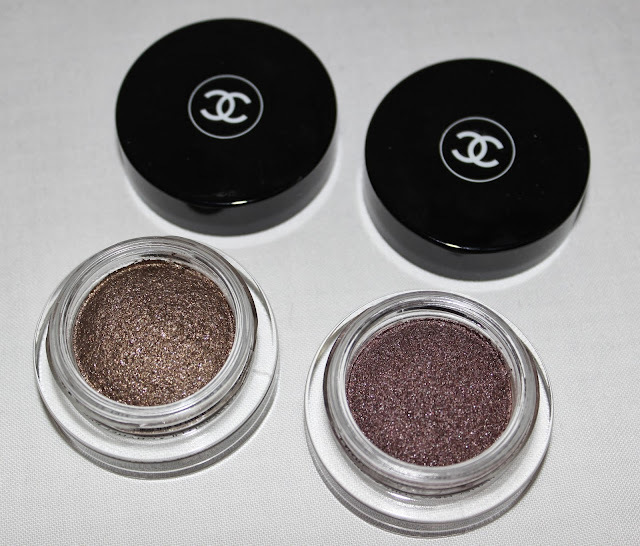 Would you sport these shades on your lids for the holiday season? How is it already November? Time seems to be flying! I am still waiting on the warmer weather though, it has teased but just hasn't stuck around. I know I will be complaining it is too hot in a few weeks times but currently, I am sick of having to wear jumpers and cardigans all the time. Oh well.. I am sure the heat will make up for the cool once it arrives. I really enjoyed this product. I love how it effectively cleanses away make up and the days grime without leaving my skin feeling stripped or dry. My skin actually feels moisturised after using this. My only problem is when I use it to remove eye make up. I always end up with it in my eyes... maybe I am just using it wrong. Haven't repurchased at this stage as I am using the Eve Lom cleanser at nights currently. I received this as a sample from a David Jones GWP bag (I think). I liked this but it felt a little uneffective against makeup and left my skin feeling tight. I think this just didn't suit my skin type. This scrub bought back high school memories, Biore reminds me so much of Clearasil and all those brands that is your first introduction to skincare. I loved the tingly clean feeling this gave my skin but it was too harsh to use more than twice a week. This was a sample I received from somewhere and I actually really liked this product. It is a very gentle cleansing milk with Shea butter so it left the skin feeling hydrated but cleansed. I was surprised how much I liked this moisturiser. It was hydrated my skin for the day but didn't feel heavy on the skin. The fact that it is 100% natural is a bonus. This is a fantastic product! I am really lazy and pretty much never moisturise my body unless my skin is feeling really dry. This just takes an extra 30 seconds or so in the shower and I come out with silky soft skin. I haven't had a chance to repurchase yet but I think I will buy the one for extra dry skin instead of this one for normal to dry skin. These were useless for removing polish. The formula was really weak and barely made a mark on the polish on my nails. I ended up soaking these with another polish remover to be able to use them up. I LOVE this product. It is really effective at sanitising my hands and it smells lovely whilst doing so. My whole family would use this when we were out and about. The scent is a lovely floral, fruity scent that had a colleague asking 'what is that gorgeous perfume?'. The only downside is it is on the pricey side for hand sanitiser - about $8 a bottle. I will repurchase but for now I am using a cheapie from the chemist. 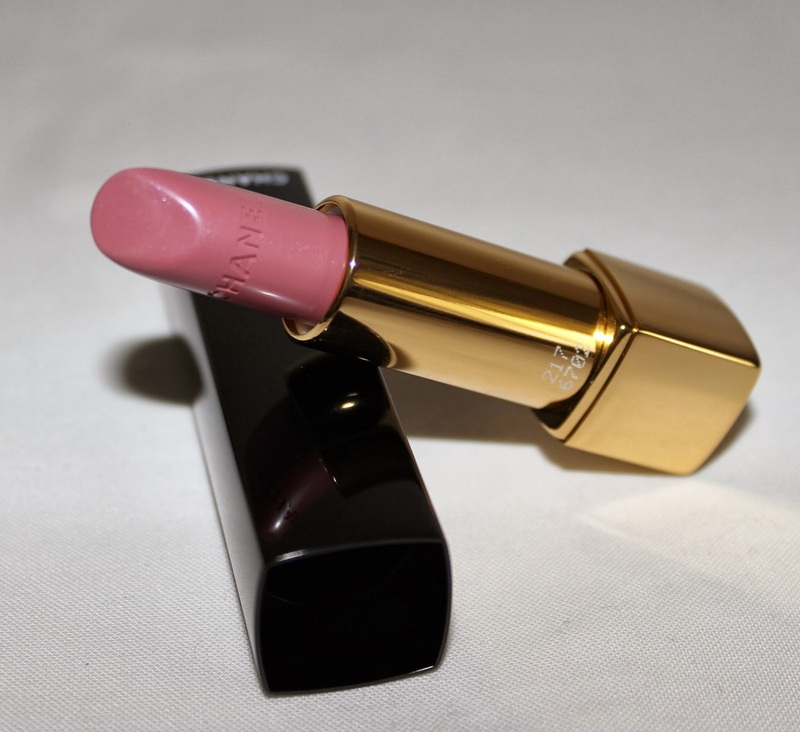 Love this product and have already repurchased (for the third time). This was an okay product, not moisturising enough for my hair but I used it a few times until it ran out. I liked to use this on occasion after the Big shampoo to leave my hair feeling really light and clean. This isn't so much an empty as it is more it has dried up and there is no point keeping it. Can't say I have used this much. I am more of a smudged out pencil liner girl than a slick liquid liner one. This was a pack of 4 square sponges with the corners cut off on one end. After using these I now understand the benefits of using a more expensive sponge compared to the bulk $2 bag I had been using. I will repurchase this soon, at $16 for 4 sponges it isn't too pricey. So there is another empties post done! I have lots of posts planned for the next month including reviews on the Chanel Christmas collection, items from the Nars & Guy Bourdin collection and a haul on its way from Sephora (via Tarazz) and Nordstrom (which now ships some beauty brands to Australia). What did you empty in October? Which of the above posts do you want to see first?